Whatever your personal stance on vegetarianism, it’s hard to deny that there’s a paradox inherent to eating meat. Most meat-eaters have at least some qualms about hurting or harming animals. Not only do many omnivores have pets, but many of them also would never want to even see the process by which the animals they eat are killed, let alone take part in it themselves. This combination — eating meat while being opposed, in principle, to the acts that are required for meat-eating to take place — suggests that omnivores come up with psychological ways to justify their dietary habits. A new paper in the journal Appetite sheds a bit of new light on this. These justifications include that eating meat is natural, normal, and necessary, otherwise known as the “Three Ns of Justification” (see Joy, 2010, pp. 96–97). Joy argues that through a recurrent process of socialization people come to believe that eating meat is natural –that eating meat is written in our biology, meat is what we naturally crave, and it is what our species evolved to eat; that eating meat is normal – that it is what most people in civilized society do and what most people expect from us; and that eating meat is necessary – that we need meat for survival or that we need to consume at least some meat to be strong, fully healthy individuals. Joy proposes that the 3Ns are widespread beliefs that are reinforced through various social channels, including family, media, religion, and various private and public organizations. For example, one popular belief related to the necessity of eating meat is the idea that one cannot maintain a diet that contains enough protein without consuming at least some meat. Although scientists, including the American Dietetic Association (ADA), America’s leading organization of nutritionists, have released numerous publications showing that this is not the case (see e.g., American Dietetic Association, 2009, Rand et al, 2003 and Young, Pellett, 1994), the belief is persistent. For their study, Piazza and his team added a fourth N — one that’s a bit obvious in retrospect. 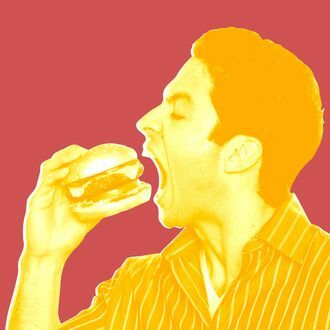 Eating meat is “nice.” That is — and pardon the complicated academic jargon — hamburgers taste good. The authors think this justification has been ignored in the past because it’s so weak-seeming. That is, in most other contexts, you wouldn’t justify an otherwise morally problematic act by saying, “But it feels good!” But they suspected it was a common way to justify meat-eating, so they included it. 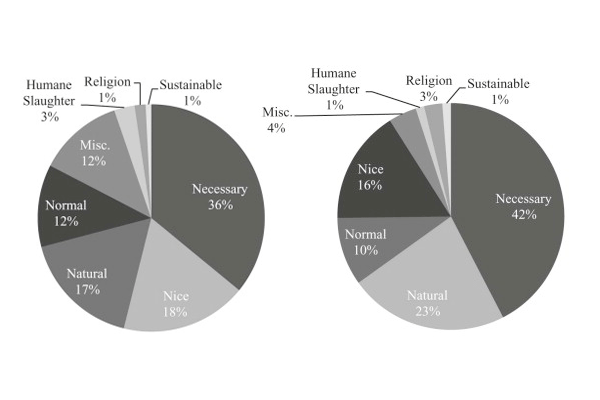 Then, it was on to the surveys: The authors ran a bunch of them for this paper, and in the first two they simply asked two samples of survey respondents — 176 UPenn undergrads in the first, 107 American Mechanical Turk workers — to generate three reasons why it’s okay to eat meat. The question was asked in an open-ended way that wouldn’t tip the respondents off as to the purpose of the survey. The researchers note that it could be useful to “test which of the 4N justifications present the greatest challenge to meat-reduction campaigns aimed at promoting healthy and environmentally sustainable eating habits.” They think that the necessity argument, being the most widely held, might also be the most “formidable” — that is, resistant to challenging. As with other forms of behavior, omnivorism is rooted in a web of social norms, habits, and a bunch of other stuff that exists more at the gut level (no pun intended) than at the level of careful, rational thought. Those looking to reduce meat consumption will probably have better success targeting these influences than simply serving up a cold plate of bland facts.